Located on the Circle Y Ranch in the historic Big Muddy Valley, The Old Porch Gallery is a showcase of local history, art, antiques and artifacts. 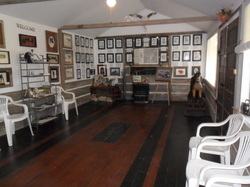 Tamela Burgess built the gallery in 1994 as a place to hang her paintings, crafts and personal collection of antiques. The gallery is open year-round. Guest are welcome to drop-in but it is recommended to make an appointment.